Do I need biodegradable products to be safe for the environment? Biodegradability is a good thing as far as cleaning products are concerned, and most ingredients in cleaning products are rapidly biodegradable. But it's not the be all and end all. Biodegradability is a characteristic of substances based on carbon, and these substances are known as "organic". 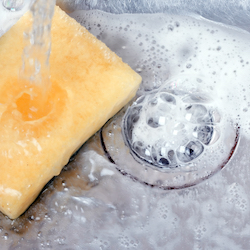 One example of an organic substance is soap; it means the ingredient is broken down by microbes when it goes down the drain and through sewage works or septic tanks. This breakdown, mainly into CO2 and water, is an important way of ensuring that the organic ingredients are removed from our household wastewater and don't enter rivers, for example, in quantities that might be harmful. Though most cleaning product ingredients are rapidly biodegradable, others may be removed more quickly via different processes, for example by light (photo-degradation). Some degrade only slowly in sewage works but are removed with the sewage sludge and then break down elsewhere. The key thing is that each ingredient must be removed, by whatever process, so that no harmful amounts enter the environment, and scientific risk assessments are carried out to ensure this happens for each and every ingredient. The Environmental Safety Check for products carrying the Charter for Sustainable Cleaning logo reconfirms this for each ingredient in the formulation, even if the whole of Europe were to use the same product. Because they are so widely used, surfactants in cleaning products must be rapidly and completely biodegradable by law. Of all the ingredients used in cleaning products, less than 3% are organic substances that biodegrade only more slowly. Even though these will be removed to safe levels by other mechanisms, the Charter for Sustainable Cleaning monitors their use and seeks to reduce the amounts used.